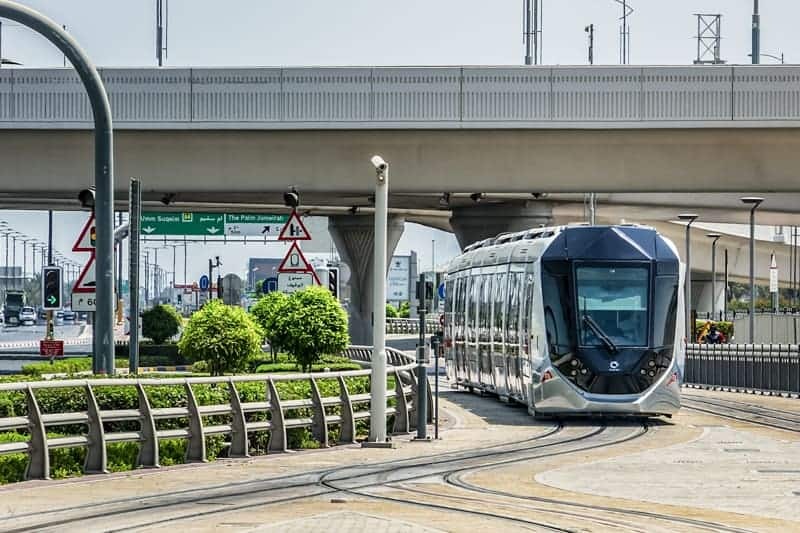 The Dubai Tram is the city’s latest mode of public transport. It opened to the public on November 12 2014. 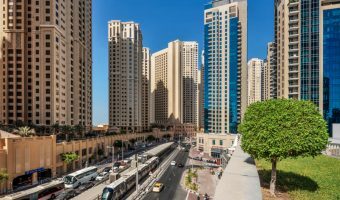 Trams loop around Dubai Marina and Jumeirah Beach Residence and then head off down Al Sufouh Road into Al Sufouh passing Dubai Media City, the Palm Jumeirah, the Dubai Pearl, and Dubai Knowledge Village. Platform screen doors are in operation at all stations. 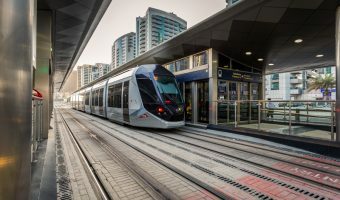 Jumeirah Lakes Towers Tram Station and Dubai Marina Tram Station connect to the Dubai Metro Red Line, giving easy access to most areas of Dubai. Palm Jumeirah Tram Station is connected to the Gateway Station of the Palm Jumeirah Monorail. In the future the stations may be sponsored by businesses and renamed. The Dubai Tram operates Saturday to Thursday from 6 am to 1 am. Hours on Friday are 9 am to 1 am. Operating hours changed to the above in November 2017. There is only a 10-minute interval (12-minute at off-peak hours) between trams so no timetable is necessary. A trip along the entire route takes just over 40 minutes. Each of the trams has five carriages and can carry 405 passengers. There are special sections reserved for Gold Class passengers and women and children. 11 trams are currently in operation. Payment is by Nol Card, the same system used to pay for trips on the Dubai Metro and public buses. A ride on the Dubai Tram costs 3 AED (4 AED for those using Red Nol Tickets), regardless of the distance travelled. The Gold Class fare is 6 AED. 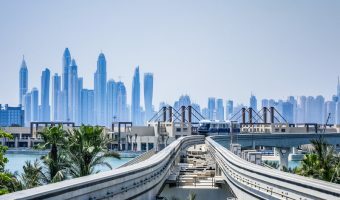 Phase II will see another 5 km of track added to the line, taking it to the Madinat Jumeirah, the Burj Al Arab and the Mall of the Emirates. Completion is set for 2020. 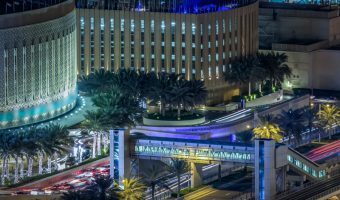 Phase III is expected to see track added along Jumeirah Road, right up to 2nd of December Street (formerly Al Diyafah Street), passing through Umm Suqeim and Jumeirah. Completion is scheduled for 2025. The map below shows the route taken by the Dubai Tram. Click here to see an interactive map with Google Street View and other features. What time is considered peak times? The tram service proved a joy to use. The NOL ticket system is simple and reliable. The Dubai Roads and Transport Authority (RTA) has opened two cycle tracks running alongside the route of the Dubai Tram. 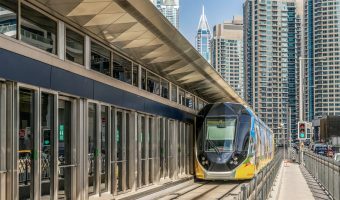 A dedicated cycle track runs from Al Sufouh Tram Station to Media City Tram Station while a mixed use track follows the route from Jumeirah Beach Residence 1 Tram Station to Dubai Marina Tram Station. The RTA has announced that Du will provide WiFi on the new Dubai Tram network. To celebrate the launch, Du will offer a free service on November 12 and 13. RTA/du should make it more convienient to login to the wifi. Doing so now requires you to enter your mobile number, receive a SMS with a 4 digit code, entering that code, and waiting for the system to log you on. It is a hastle. Also, the first 10 minutes you are given ‘premium’ speed, then it boots you off when it has to switch to ‘normal’ speed. Essentially, the wifi is only good for less than 10 minutes of use because of all the time needed to login counts toward your ‘premium’ time. The system needs fixing. The Dubai Roads and Transport Authority (RTA) has announced the operating hours of the Dubai Tram. Services will run seven days a week. Hours from Saturday to Thursday will be 6.30 am until 1.30 am (the next day). On Friday trams will start running at 9 am and run until 1.30 am (the following day). At peak time there will be a tram at each station every 10 minutes. At off-peak times the frequency will be every 12 minutes.